Jim West, who is known to many readers here, is causing a heated discussion among some members of the Society of Biblical Literature, the largest professional organization of biblical scholars in the world. West does not supply any data for this or his other claims, and a simple visit to the Annual Meeting of the Society of Biblical Literature shows that it is overwhelmingly composed of Euroamerican biblical scholars. I am one of the very few Mexican Americans in the Society of Biblical Literature. But more importantly, West fails to see how it is he who has benefited from privileges that minorities might not receive. 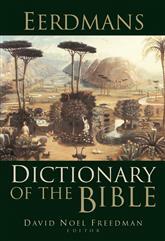 One case in point is his selection as a contributor to The Eerdmans Dictionary of the Bible (2000), which was edited by David Noel Freedman, one of the most renowned biblical scholars in the last century. West wrote the articles on “Apollyon” (p. 78) and “Sheol” (pp. 1206-1207) for that publication. True enough, these are small articles, but they do make a larger point about how or why some contributors are selected while others are overlooked. West is listed as “Adjunct Professor of Bible, Quartz Hill School of Theology, Petros, TN” in that reference work. Anyone who has inquired about the status of that institution knows that it is mostly a mirage. I have written an essay discussing West’s bogus credentials before, and how he has used them to insert himself into academic biblical studies. John Loftus has also highlighted the issue of West’s credentials here. Yet, I have also seen many reputable scholars defend his credentials, arguing that it is elitist to demand a doctoral degree. However, in the case of West it is not about lacking a doctoral degree, but about the bogus nature of that degree. It is about misrepresenting your credentials to gain advantage over others, including minorities, who have worked hard for theirs. I don’t think we should ever employ anyone in any scholarly project, major or minor, who misrepresents their academic credentials. Period. A. Has any gay Asian woman with a phony or questionable doctorate from a bogus institution ever been chosen for a biblical studies reference book? B. How many minorities with a phony or questionable faculty position at a bogus institution have ever been chosen to write for a biblical studies reference book? I personally don’t know of any. But this raises the question of how West was able to be selected for such a project at all. It certainly is not because of West's academic qualifications or extensive record in peer reviewed journals in biblical studies prior to that selection. I don’t see prior academic or peer reviewed work on Sheol or related topics prior to his selection, and scholars ideally should be selected for some expertise relevant to the article they write. For example, I was asked to write the article on “Illness and Health Care” in the same reference book based on two prior books on health care: Illness and Health Care in the Ancient Near East: The Role of The Temple in Greece, Mesopotamia, and Israel (Harvard Semitic Monographs 54; Atlanta: Scholars Press, 1995) and Health Care and the Rise of Christianity (Peabody, Mass. : Hendrickson Press, 1999). One could argue that West was given only minor assignments, but the fact remains that such reference works are usually advertised as employing recognized scholars in the field. True enough, many young scholars starting out are sometimes chosen for some of these smaller articles. I was only a doctoral student at Harvard when assigned to write a few minor articles for The Anchor Bible Dictionary (1992). If editors and senior scholars, who are usually responsible for managing such reference book projects, are concerned about employing underrepresented minorities, this would be one place they could do it. But instead of choosing an underrepresented minority for such an assignment, they chose to employ someone with no substantive academic qualifications. Why would that be? One hypothesis is that West is a white male who is viewed as more qualified despite his blatant and even deceptive self-descriptions as a “doctor” and a faculty member at an institution that barely exists beyond a webpage. Those in power in our field saw him as qualified when they could have chosen to help an underrepresented member of a minority community enter into a reference publication project. To be clear, I am not arguing that potential contributors or editorial board members should be chosen because they are members of an underrepresented minority group. It’s the opposite. I am arguing that you should not choose someone that is unqualified, while overlooking minorities who are qualified. If this had been done, there might have been room for at least one more scholar from a minority community in the Eerdmans Dictionary of the Bible but the editors chose an unqualified white male instead. If this had been done, some editorial boards might have included another underrepresented minority member instead of a white male with questionable credentials. Some might describe West as exploiting white privilege in the Society of Biblical Literature and in the broader guild very effectively. Therefore, the next time a scholarly project is planned or an editorial board is selected, those in power should ask why a white male with no real academic qualifications ever should be chosen over underrepresented minorities with more qualifications.